Lordship Lane is Dulwich and East Dulwich's main shopping street. The Plough public house, on the left of this view, is its most ancient pub. For those working to nourish the brain, rather than the body, Dulwich Library, opposite, on a site donated by the Dulwich (College) Estate, opened in 1895. 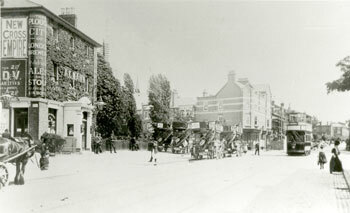 Trams ran the whole length of Lordship Lane from 1907. The horse tram ran through to Peckham Rye.